Our Lenten journey draws to a close during Holy Week. it rapidly becomes Passion Sunday in order to tell the story of Jesus' final days. which was the Seder dinner shared by Jesus and His disciples. Jesus became the servant of all by washing their feet. He then instituted what we now celebrate as the Holy Eucharist. Good Friday recalls Jesus' arrest, trial, crucifixion, and entombment. Holy Saturday is a day of emptiness. We begin Holy Week with the Triumphal Entry of Jesus into Jerusalem on the back of a donkey. The Gospels tell us that people threw their cloaks and palm branches to carpet the road as he entered the walled city. 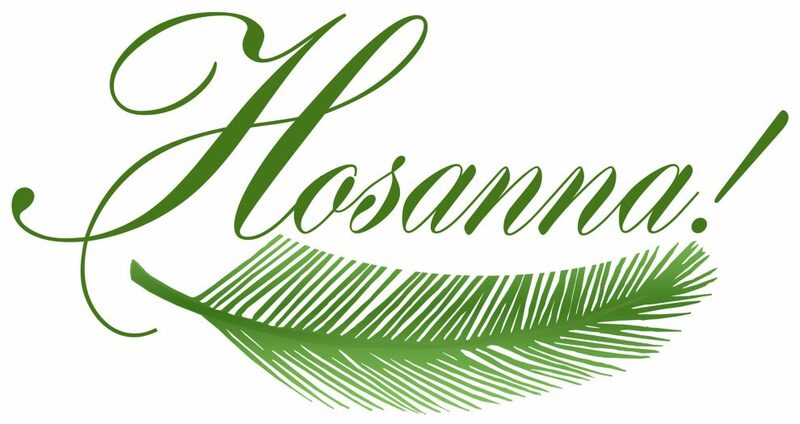 Our 10:00 am Palm Sunday worship begins with the Blessing of the Palms at the rear of the Church. We then process out and around the building while singing "All Glory Laud and Honor," ending at our seats in the Church. Do this in rememberance of me. Jesus entered Jerusalem just days before the Passover, which drew the faithful from through Judea and beyond. He spent several days teaching in the Temple, but Passover began on Thursday evening that year, and Jesus had his disciples arrange an upper room where they could share the Seder meal. After becoming the servant to his followers, Jesus presided at the Seder. He established for all Christians the Holy Eucharist (Thanksgiving), which we emulate each Sunday, and especially on this night. We gather at 7:00 pm to begin our Triduum (three day) observance. As the Maundy Thursday liturgy unfolds, we will emulate Jesus in washing each other's feet before celebrating our final Holy Eucharist of the Lenten season. The Altar of Repose has been set up on the South side, to recall the Garden of Gethsemane. All of the remaining Body and Blood of Christ is processed to the Altar, where an overnight Vigil will be kept with it. The main Altar and Sanctuary will then be stripped of all ornamentation, leaving only an overturned Cup to recall the absence of Christ after her arrest on that evening. The people will depart in silence (or to begin the overnight Vigil) without being dismissed; the Triduum Liturgy continues on Good Friday. In a miscarriage of justice, Jesus was quickly tried, convicted, and crucified with a matter of hours. Again, we gather at 7:00 pm to offer the Stations of the Cross, moving around within the Church to each of the 14 stations that grace our walls. They retell the story of Jesus journey to Golgotha, carrying the Cross on which He will be crucified. From there, the Good Friday liturgy continues with the Solemn Collects, and the reading of the Passion of our Lord Jesus Christ from John. The Reserved Sacrament will be brought back from the Altar of Repose and consumed; there can be no celebration of the Holy Eucharist on Good Friday. Again, the people will depart in silence without a dismissal. The Triduum Liturgy would normally conclude at the Great Vigil of Easter on Saturday evening, but this year we will hold it over to the start of our Easter Sunday morning service. There will be a very brief Holy Saturday liturgy at 11:00 am that resembles a graveside burial office.